If you’ve read part one and part two of my side income hustle series here on Modest Money, there’s a running theme through my articles. And that theme is that there’s opportunity on the web like never before. With the trend of digitizing and new methods of marketing, these have both opened up the door to new jobs and new service areas to fulfill. In fact, there are areas (such as mobile) that are in such a growth curve right now that the demand far outweighs the skilled workforce. I just read an article that clearly shows mobile as the top “most in demand” tech skill. So if you happen to be in school or plan on attending anytime soon, give mobile a look and you’ll be able to pretty much call the shots on your salary outright. 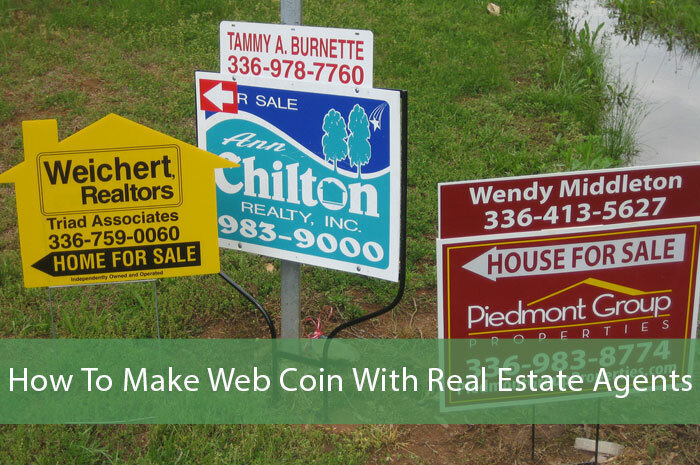 With that said, below we look at three ideas on how to make coin with real estate agents. These ideas are aimed at those who already possess some skill and experience with web work. Real estate agents need websites. Plain and simple. It’s like the business and calling card of the new century. Seeing as most research for home buying is done online these days, it makes perfect sense for them to set up shop on the web and create a resource aimed at homeowners who seek this information online. However most real estate agents do not have the time to create their own websites. Guess what? They will gladly pay someone to create and design the perfect site for them. This is where you come in. You can make yourself available as the go to person for websites aimed at real estate professionals. Market yourself in the circles where they tend to hang out and go after them with all your might. What good is a website these days without a blog to communicate with your audience. Real estate agents are in one of the most communicative fields out there, and a blog is where an agent can really stand out from the crowd and make him or herself the mouthpiece for his city and truly make a difference. He or she can comment on all sorts of area findings, tips, information, news and trends. However as mentioned above, most good agents do not have the time to sit behind a desk and blog. They’re busy with clients, cold calling, networking, selling, etc. This agent would be your ideal client, because it’s someone who has the funds and needs your blog writing assistance. Just so happens that you offer this service, right? Out of the three ideas mentioned on this article, this one is probably the best one to begin with. Simply because most established and experienced realtors will tell you flat out “they ain’t got no time for social media”. Well maybe not in those exact words. By now in the middle of 2012, it’s pretty safe to say that just about everyone sees the potential and ROI in using sites such as Facebook and Twitter for business purposes. One cannot pick up a business magazine or hop on a business blog and not see dozens of articles extolling the virtues of running a Facebook campaign or setting up a Twitter chat. However, the one thing needed to run such campaigns and to effectively manage them is the one thing real estate professionals do not have – time. Even if you just do social media for one agent two days a week, the trick is to get several clients that you do this for. The more clients you have, the more work you will get and more money you will make. You can offer your services on everything from updating business Facebook pages, Twitter accounts, networking with others for them and generally create visibility for said agent. It’s really their job to tell you how they need you and what you can do for them. Not the other way around. If an agent has no idea what social media is or how it works and what you can do for them. This is NOT the ideal client for you. Ideally they see the value in social media and how you can help them with it. The three ideas above are interchangeable with various client profiles, such as lawyers, doctors, and other similar professions. Simply wipe out real estate agent for who you want to work with. The idea is to market yourself as the go to person for this type of service. What other ways do you envision professionals needing web help? I know just enough programming to get myself in trouble, which my brother/web designer then has to fix! You probably know more than the agent, but this is not about trying to perform a skill as opposed to actually doing it. So it’s best to have the skill already and then go after those who need it. Actually, when we were home shopping earlier this year, I was pretty impressed with the sites of realtors we looked at. Ironically enough, NPR did a piece this morning on the need for more computer programmers. Interesting! I don’t know enough about home ownership/real estate/web design to do any of these things but it’s all a great idea. I think Krystal from Give Me Back My FIve Bucks does something with a real estate agent online. Great example you gave us there with Krystal. Hopefully she reads Modest Money and will come on over and share her details. i) It can get frustrating, the agents focus is to sell/bring business, not their blog/social media. Those don’t make money for them in most cases. ii) Lack of proper money or willingness to invest money on these things. Again, they don’t value it as a something that will generate them money. iii) No true direction, so you’re left for your self to suggest, pitch ideas, and a lot of trial/error. iv) They heard about social media, blogs etc….but don’t know how it works, its impact or its end goal. Can be tough at times to make someones vision come true if they don’t have a good understanding of something. Just my two cents. Great post though. I agree with you – most realtors either get it or don’t. Those that are already not using social media are so behind the curve right now. I second that. If the agent doesn’t “get it”, then there will be lots of hand holding and your time will be better spent elsewhere. It’s important to be able to tell if the agent you’re looking at as a potential client is one who does get it and simply wants to hire you as the service provider for said service. You’ll have a better time with this client and less time spent hand holding and demonstrating value. @Steve – Thanks for weighing with your feedback. Well said. I’ve done some web work for people working in sales, though not real estate sales. It was a similar situation though. These guys have ‘bigger fish to fry’ than worry about setting up a blog or website or social media strategy. Good target market. I think it’s a catch 22 where they don’t see the value but once they do see it, simply don’t have the time to do it. Ideally the client you’re after sees the value and wants you to help them with it. What great ideas! I’ve never done any of them, but it seems like a bunch of people are profiting from the need. Absolutely, many are. I know Ribeezie (on Twitter) is like the go to guy for real estate pros who have questions on blogging and social media. He even does speaking and conferences on the topic. He pretty much exemplifies what I talk about above. Missy, great article on what you can do to help out busy folks to make some nice side money. You highlight real estate agents, but this could honestly be used with any busy professional such as accountants, lawyers, and others. Who wouldn’t want to see a few tweets ffrom their accountant on tax tips throughout the year to lower their ultimate tax bill? I do. I want to see tax tips from my accountant service provider. It’s how inf is processed now, people expect it. I see stuff on my Facebook and Twitter (all the time) from various company providers. Just because someone isn’t on Twitter or FB does not mean they’re behind time or unsuccessful. For example I work for a family owned business that does $25M a year in sales that doesn’t use FB, Twitter etc….and the business is profitable and strong. This is simply because the industry that we’re in doesn’t rely on FB or Twitter, instead they prefer the simple traditional ways such as faxes, emails, phone calls, face to face and trade shows. Most of our clients don’t have time to be on Twitter or FB. They’re out there working, growing, and earning $$. I agree with you. I have family members who own businesses and none of them have Facebook or Twitter,but instead rely on the old fashioned way of communication. I don’t think all businesses need to rely on social media. Some have a reputation that speaks for itself. On another note I think the idea of making websites for real estate agents is a great idea. Good point and I’m glad you brought this topic up. I think that with social media is isn’t necessarily about selling and or making money but about meeting the consumers where they tend to be – which nowadays is Facebook and Twitter. Tomorrow it might be something else. It’s human nature to share. And social media has simply tapped into this most basic need and because of FB and the other social networks we do it even more than before. You have to get into the mindset of the (user) and not as the business owner or marketer. I agree not everyone is on these sites and not everybody uses these, but a heck of a lot of people do. FB alone has over 800,000,000 million users. That’s insane, isn’t it? It’s new and it’s not going away anytime soon. Does one need FB and Twitter to survive and grow as a business? No. You clearly prove that. My brother is in real estate and he is NEVER online and NEVER sitting behind a desk looking at his laptop. But he did go out recently and get himself a shiny new iPad 3. I’m not sure what he uses it for, but am betting he uses it for email checking, and maybe to show clients various things on the famous tablet. It’s lighter and more portable than a laptop. And he’s not a big typer, meaning he doesn’t create a lot of documents for which a keyboard would be better suited for. My point is that my brother who is as far removed as a techie can be and wouldn’t know what to do with a Facebook page if his life depended on it. Went out and got himself a tablet, the rest cannot be too far behind. I can’t stress enough how successful companies all have fantastic websites and social media marketing. If a company has a defunct website and no “gathering” of people upfront, I’ll admit I will have doubts. This is how I select dentists and doctors actually (I’ve noticed). I look em up on Yelp and then proceed to scope out their website – credentials, reviews, pictures, graphics all play an important role. I do the same thing. Not only do I check them out on FB and Twitter, etc but I also follow because sometimes merchants give good discounts, mention special events and (even provide customer service) via social media. Real estate agents need all of these to reach a larger target market. While they could honestly do these themselves, many are far too busy throughout the day working with clients. That said, this would be a great opportunity if you are skilled in these areas, and would like to work with realtors advance their business. Absolutely. If one is a good agent you’re not in an office pushing paper, you’re out there getting business and taking care of clients. That’s why it’s a boon for service providers. Thanks for commenting. You can also clean REO properties. With the foreclosure backlog, I understand that this is a growing industry as well. Thanks for the tip, Wayne. Good one. I have done work for some other contacts before in other industries and that has worked out well. Go for it, Miss T. Sounds like a good plan to me. Lol. The only problems with Number 2 and 3 is maintaining the voice and message in a specialized area. Most of the time here the agent / broker just need to be consistent and if that is something you can help them with then great. You’re right. If you’re hired to write on behalf of someone else then you need to keep their voice in mind (if they give you one) and also keep the messages and personalities in sync. Thanks for your comment, Anton. I like your thinking, but are real estate agents a hard sell? They seem so busy to me..do you think an agent without a site would A) be open to listening to your pitch and B) be able to justify the expense? Seems to me that this could apply in any sort of industry where you think you have enough contacts/knowledge to make make the pitch. I guess the best way to figure out which local industry you could make most impact in would be to do a Google search for local businesses using standard keyword terms. When you stumble upon poor listings from a consumer’s standpoint, then you have a winner. I personally don’t think real estate agents are a hard sell. I think any industry will have its fair share of those who are busy and maybe not open to other avenues of promotion. Like I mentioned in my article, the ideal client will already be familiar (and sold) on social media, but simply not have the time to do it. If you have to explain social media to your client, this many be more trouble than its worth. Because if they don’t get any clients (like yesterday) from your efforts, they will most likely blame it on social media. Or they will maybe not know what to ask of you, etc. It’s all about your target market. My tax clients barely use the internet, let alone read my tweets. The demographic I’m servicing would not benefit from me sending out tweets and facebook updates. If you plan to do this for a real estate agent, get to KNOW THEIR AUDIENCE. If they are working with first time homebuyers, most likely it’s a younger crowd who would love to read a blog or subscribe to their twitter feed. If older investors, twitter might not be the best option. That being said, you should also sit down and talk about GOALS. If this agent’s audience is not connected with social media, but they want to EXPAND their clientele to more tech savvy clients, then you can use that as your value proposition to get them to jump into the twitterverse, blogosphere, and ….. uhhh…facebook-land? I think you hit the nail on the head when you mention that if one wants to reach a younger demo or reach a more tech savvy audience – then one should consider social media. However that really applies to those who are seeking additional business, if you already have more clients than you can handle, then there’s really no need to go out there in social media land and tweet, Facebook, etc. Or is it? It just depends on your overall goals. Thanks for chiming in and adding your opinion.